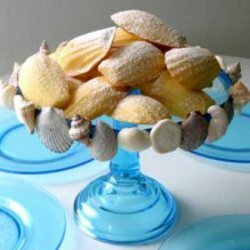 Make this Simple Sea Shell Cake Stand for some seasonal decor at your next summer party! It's so simple to do that you can throw this.home decor project together minutes before your party starts! This great quick project is from is from the magazine Holiday with Matthew Mead Summer edition. Use a hot glue gun to adhere thin ribbon around the cake stand's edge. Hot glue the clean shells to the ribbon in the order of your choosing.